Summary LEAVE NO TRACE is a US drama in which a man and his teenage daughter are forced to rejoin society after years of living in the wilderness outside Portland, Oregon. 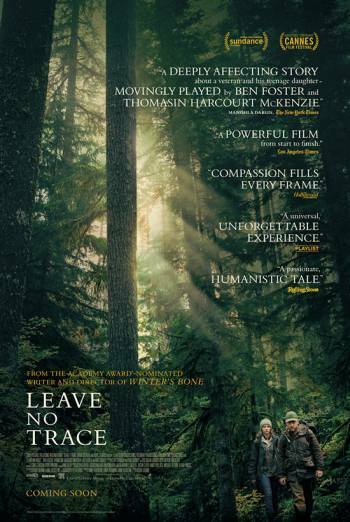 LEAVE NO TRACE is a US drama in which a man and his teenage daughter are forced to rejoin society after years living in the wilderness outside Portland, Oregon. There is infrequent strong language ('motherf**ker'). A man is seen with a bloody scrape on his head after falling in the woods. He also injures his foot, which is seen with some blood and bruising on the toes. A man sells his prescription medication for money. There are also occasional verbal drug references, for example to the legalisation of marijuana and to the risk of people getting hooked on pain-killers. A teenage girl is questioned by a social worker who asks if sleeping in a tent with her father makes her uncomfortable and whether anyone has ever touched her body without permission. The girl is quick to assure the woman that her concerns are groundless. A former soldier is implied to be suffering from PTSD and there is brief sight of a newspaper headline reporting on suicide in the military.